STOLEN PROPERTY VAULT, YOUR VIRTUAL TOWN, 16 March — Italian contemporary art critic and curator Domenico Quaranta has a recent post on Artpulse, “Eva & Franco Mattes: Attribution Art?” wherein he interviews the many “victims” of the Mattes art thefts. I’ve stolen from the Mattes myself, and I have to admit, I do love the smell of stolen IP in the morning. 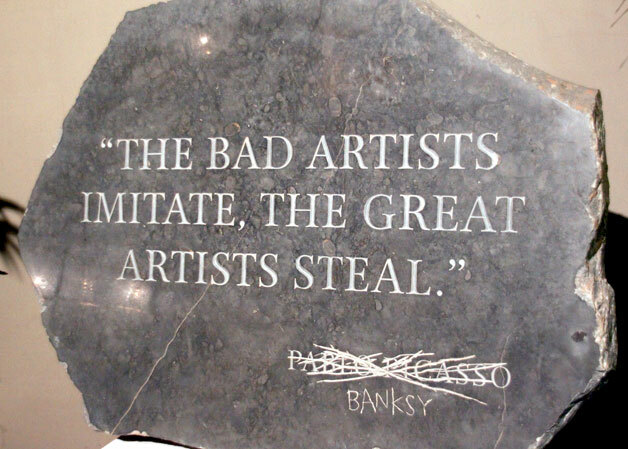 Probably many people’s favorite example of IP theft is Banksy’s famous Picasso theft. Quaranta was the lead author on the Charta volume Eva & Franco Mattes and is generally a pretty smart / insightful guy. His Artpulse article is good for a small epiphany or two. I know you’re busy/lazy, but try to actually make it down to the credit line at the bottom. hahaha, according to Google Image Search, this image may be subject to copyright.